Whether you're designing a network, a business plan, or an office building, Visio 2007 can transform your vision into sophisticated diagrams and drawings and this comprehensive reference shows you how. You'll discover how to use Visio for IT, architecture, engineering, and business projects; explore the new features of Visio 2007; learn to publish Visio diagrams to the Web; and much more. If you want to develop your skills in Visio, this is the book you need to succeed. Bonnie Biafore is a project manager with more than 20 years of experience managing engineering and software implementation projects in numerous industries. With a background in structural engineering, architecture, and project management, she is well versed in using Visio for engineering, architecture, software development, business analysis, and project scheduling. Part I: Understanding Visio Fundamentals. Chapter 1: Getting Started with Visio. Chapter 2: Getting Started with Drawings. Chapter 3: Working with Visio Files. Chapter 4: Working with Shapes. Chapter 6: Working with Text. Chapter 7: Enhancing Diagram Appearance with Formatting. Part II: Integrating Visio Drawings. Chapter 8: Inserting, Linking, and Embedding Objects. Chapter 9: Importing, Exporting, and Publishing to the Web. Chapter 10: Linking Shapes with Data. Part III: Using Visio for Office Productivity. Chapter 11: Collaborating with Others. Chapter 12: Building Block Diagrams. Chapter 13: Constructing Charts and Graphs. Chapter 14: Working with Organization Charts. Chapter 15: Building Visio Flowcharts. Chapter 16: Documenting Processes, Workflows, and Data Flows. Chapter 17: Scheduling Projects with Visio. Chapter 18: Documenting Brainstorming Sessions. Chapter 19: Analyzing Results with PivotDiagrams. Part IV: Using Visio in Information Technology. Chapter 20: Modeling and Documenting Databases. Chapter 21: Building UML Models. Chapter 22: Building Software Development Diagrams. Chapter 23: Mapping Web Sites. Chapter 24: Creating Network Diagrams. Part V: Using Visio for Architecture and Engineering. Chapter 25: Working with Scaled Drawings. Chapter 26: Creating and Managing Scaled Drawings. Chapter 27: Laying Out Architectural and Engineering Plans. Chapter 28: Planning Space and Managing Facilities. Chapter 29: Integrating CAD and Visio. Chapter 30: Working with Engineering Drawings. Part VI: Customizing Stencils, Templates, and Shapes. Chapter 31: Creating and Customizing Templates. Chapter 32: Creating and Customizing Stencils. Chapter 33: Creating and Customizing Shapes. Chapter 34: Customizing Shapes Using ShapeSheets. Chapter 35: Formatting with Styles. Chapter 36: Customizing Toolbars and Menus. 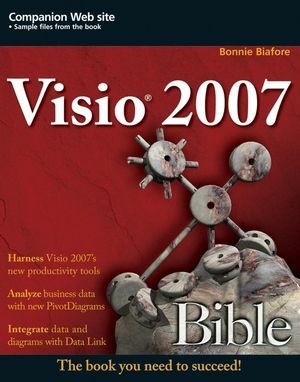 Chapter 38: Installing Visio 2007. Chapter 39: Visio Help Resources. Chapter 40: Additional Resources for Templates and Stencils. Chapter 42: Template and Stencil Reference.